TopSoil wrote: It is indeed looking great. I would love to play the map before FS17 comes out. O.K. But remember it's not completed yet. But is playable, I made some fixes to the map so I will re upload the fixed map to mediafire tomorrow. And Then I will send the link to you in a P.M. Your Midwest map - I told my Australian wife, "you gotta look at this. I swear I saw that exact house about 2 miles from my grandpa's farm. And that barn too! And see how they've got a flag outside .. that's so common in Iowa"
Appreciate the effort and detail of your work, mate. Well I thought I would post one more photo. And the map is still being worked on. Yeah, nice looking map Farmboy, I'm just now learning the Giants editor myself, not too much trouble because I I've done, and still do maps in BF42, BFV, and BF2 (along with the Crysis and that wild editor), and I plan to keep doing FS15, as well as FS17. once I learn it. All I had to do for FS17 and Battlefield 1 was invest in a new video card, and went with the Sapphire RX480 8GB Nitro @ $279 bucks American. It's the best bang for your video dollar right now, and the words out on the streets that it is the card to get for FS17 if you like your eye candy like I do. I just retired (put it in another workstation) my ATI Fire Pro V7800 2GB card, and it is an awesome gaming card for being a professional workstation video card. If it would help, I can connect you to one of my clients, and get you either a Dell Precision T3500, or HP Z620 workstation for cheap (for what your getting, wow). I'm playing on a Dell Precision T3500 with a Xeon W3680 6 core, 12 GB ram, and an excellent board and chipset for $350 bucks, carry it out the door. That machine, new in 2010, sold for $26,000 bucks with the ATI Fire Pro V7800. I love the truck and grain hauler! What's the capacity of that baby? Woah! Where'd you get that John Deere S series combine?!? Looks sweet!!! The whole map looks gorgeous. 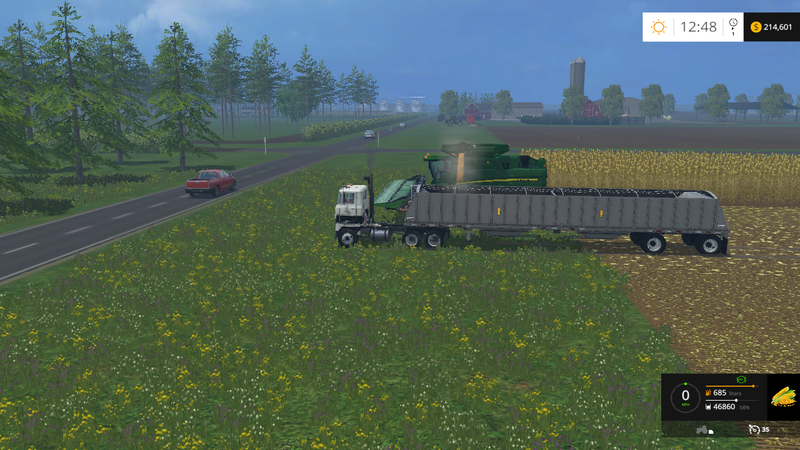 The trailer I have set up to haul 80.000 and the harvester I got from LS15 mods. And I set it up to load 50.000 I know that's not realistic but it works for me. farmboy002 wrote: The trailer I have set up to haul 80.000 and the harvester I got from LS15 mods. And I set it up to load 50.000 I know that's not realistic but it works for me. Yeah I do the same with the harvester's capacity. What kind of truck is that? It looks kind of like an old IH "Emoryville." I used to own a 1978 cab over (no sleeper) IH with a 290 Cummings and fuller 13 speed roadranger. That was a running little truck, and she pulled like a mule. JohnDeere318 wrote: I would like to thank you for putting in a lot time for these maps! I do appreciate the great maps! Do you mind if I convert the maps to FS17 when it releases? No,Thank You JohnDeere318 for kind words and for downloading my maps. And if you know how to convert them to fs2017 go right ahead and do it. Thanks!! I will let you know when it gets closer to the release. I will buy the Media Vault (I want to convert some mods I would like in FS17 anyway). Can't be arsed to type anything here!!!! farmboy002 wrote: Well I think I'm going to just keep playing fs2015. My money bag is always empty.. Plus I would need a new P.C. to play fs2017 on. So I decided to just keep building maps for fs2015. So if anyone else is staying with fs2015 I'll be putting up a new map soon. 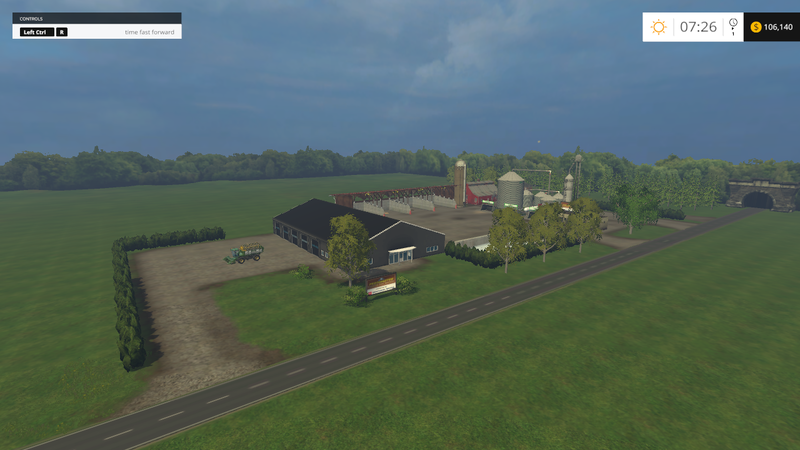 This is the feedMill and I am going to have three farms you can sell mixed feed to on top of a lot more to do. This is the BGA with a lot full of tree's to the south. After cutting down all the tree's you can then hire a worker to help harvest the grass to fill the bunkers at the BGA. No need to hold out on FS17. the game runs much better then FS15. I always had to be picky about the mods I would use. But with FS17 every and all mods and vanilla stuff is loaded in the game, still running at 60FPS with setting on highest. Couldn't agree more, FS17 runs way more smoother than FS15. FS17 is what FS15 should've been from the start. I don't need any mods, like I had to use in FS15. I'm disappointed in FS17 myself, and for various reasons, and none that have anything do with how well it runs as compared to FS15. All I can say about that is I didn't need to spend all that money on a new video card for sure; A much cheaper card with updated shaders would have worked just as well, but I digress. I'll only add a couple of the major reasons that I'm disappointed, and of course this is just my opinion, and everybody gets one. right, but I just not afraid to express mine. Logging - Forestry That's my area of real displeasure. There was really nothing wrong with the rate structures for timber in FS15, and it was quite close to real life scaled to proportion. To do it right and maintain a sustainable income, and replacement planting your going to have to invest, on average, $750,000 bucks in game, and millions in real life. A new Ponsse Scorpion is a lot more than the $317,000 in game price, their nearer $450,000, and I saw a used 2014 Ponsse Buffalo with the tracks package on Equipment Trader for $269,000. That being said, you have to have all kinds of support vehicles, and in real life maintenance crews, rent, employees, and the list goes on. My point being you should be making between $150,000 to $250,000 per day to survive. Your hard pressed to do that in Bjornholm, and you can get to $250,000 per month (game cycle) on Westbridge if you tree farm, which is a huge investment in itself. I have made a half million on Sosnovka in FS15 a couple times, but I worked my but off around the clock to do it, and have it counted on that days harvest; it's hard work, cutting, and loading log after frustrating log, hauling them to the sales point, and doing it again. I haven't really evaluated if I'm making any real money on on Goldcrest in FS17, I haven't invested in the Ponsse equipment yet, and just using the small trailer with crane, a NH T6 W/EF loader and log hook, and a chain saw. I'm rather fast with this rig as I've probably cut and hauled thousands of logs with this little setup because I start every map with it. When I'm working in game I have the time ratio at 1:1, real time, and I can cut a load, and I mean a load, haul it to the sales point, sell, and be back in about an hour. After awhile I get so fast with that frontend loader its a blur, but practice make s perfect. I've made a couple of loads by train to sell logs, but was very disappointed in what they brought for the time and effort to cut, haul, and transfer twice with the train system. I mean I,m clearing expenses by shear economics of scale, but nothing impressive, and the train system could have been such a boon, even with the extra labor with transfers, it would have been more than worth it. So to say I'm disappointed is an understatement. But that train system can be back ported, the basics are already there in Sosnovka in the FS15 gold edition. There are so many more things like only one map, and it's supposed to be American, but Colorado? In the Rockies? Why not Nebraska, Iowa, or Texas for example where you have fields 5 miles on a side. I guess Colorado looks kind of like Europe, or maybe Switzerland? Oops, did I say that? Hey Goldcrest is okay, okay, and I like Sosnovka, but how about at least one other new map? I mean a Battlefield release had at least 10 maps, come on. And last, I promise, the blankity-blank General Editor versions 6.0.5 & 7.0.2, they are on the verge of worthless, and armature as real game editors go. One of the reasons I liked this game, besides the obvious, is the ability to make my own maps, with is one of the first things I do with any game I get; and I only get the game I can mod it. So to have a really crappy, feature poor, quirky editor like the Giants editor is a real let down. Hey I'm getting used to the FS15 version because it's been around long enough to where the community has figured out workarounds. I've tried and tried over at GDN forums, and that's a total waste of your time I can assure you. That's where your supposed to go for answers, and they are clueless! All the Giants people tell you to do is follow their woen out, out of date tutorials that don't even match the editor, or the version you have, and they're worthless. That's all have time for now, but I guess if you don't mod or map, FS17 is cool, but JohnDeer318, if all the good mod stuff from FS15 is in game in FS17, where's my T66 BigBUll tippers? Hummmm? I'm trying to port them, but no one seems to be able to help me. I can get them to show up in the store, but you can't buy them, but there are hundreds of us with the same problem, and nobody with giants at the GDN can give you an answer. Nothing but a vague reference to a possible new update to the already recently updated editor. Imagine my frustration?